In a time where sports cars are fitted with rockets and deployed to Mars it seems appropriate to cover some news about space invaders too. Sorry about the bad joke, but it will become clear in a bit, as naming a particular company SpaceInvader can actually be very meaningful. The Danish company SpaceInvader was founded in 2015 when Jesper Rølund came up with an idea for utilizing all that extra space inside all those trucks and warehouses. A system was patented that enabled pallets to be stacked very easily, making it possible for 2 pallets to only take up the space of 1. The system is simple, modular, and easy to handle, yet strong enough to handle the loads of standard EURO-pallets. Greater efficiency, less cost, better ergonomics and lesser environmental impact are the documented gains after six months of testing SpaceInvader’s transport system at ASKO, Norway’s largest food distributor. The system is Danish design, made in Denmark, and consists of a pallet rack system that enables double stacking of goods, helping distributors and carriers to earn money from unused space! We have tested SpaceInvader on a route in central Norway. We have saved a whole truck load each week — a saving of 20%. It’s thousands of kroner just in transportation costs. Add to this the environmental benefits. On this one particular route (Trondheim to Mo i Rana = 484 km), ASKO has calculated the savings to be at least 49,000 dollars and 30,000 tons of CO2 per year. 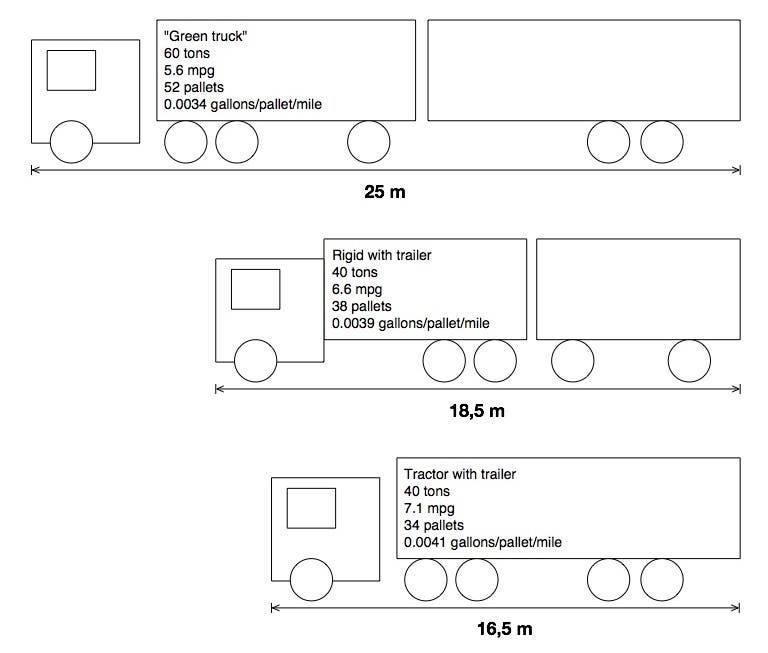 With regard to reduced CO2 emission from using SpaceInvader, the climate and environmental dimension lies in the fact that the SpaceInvader system makes it possible to load significantly more freight into each truck because the goods can be double stacked, thus utilizing the 50% of free space that the average truck has, resulting in fewer trucks on the roads. Today as much as 85% of all trucks drive around with unused space. This situation must change if we want to reduce the environmental footprint from transportation. Logistics companies are constantly looking for measures to make transport more sustainable. And ASKO is a great example, as they plan to become climate neutral and phase out fossil based fuel by year 2020 — and they see the SpaceInvader system as part of that impressive ambition. Susanne goes on to explain that the SpaceInvader system obviously works with all kinds of trucks, because it is designed to work with the standard EURO pallet, of which 500 million are being moved around in Europe on a daily basis. That translates to an enormous potential in savings. In the trucking industry a lot of factors are in play when it comes to squeezing the most out of your assets, apart from optimizing the filling of cargo space. I had a chat with an acquaintance working at one of the largest trucking companies in Denmark Frode Laursen, and we talked about several other things to consider, like driver skills to improve mileage, replacing old trucks in due time (to electric when feasible), shared facilities, planning, and design of the trucks. 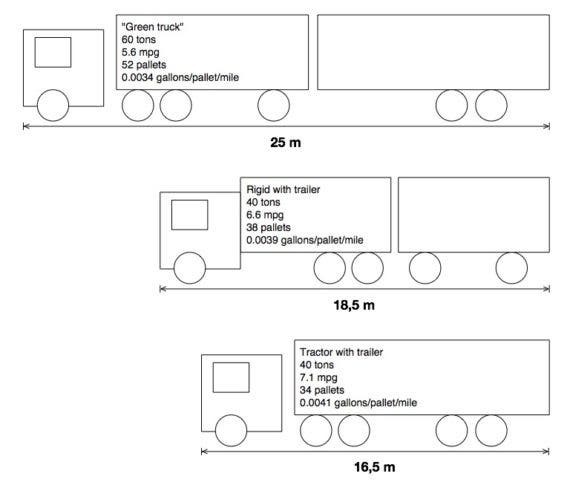 It’s clear that the optimum use of space inside the trailer is a big deal (by the way, the rigid and tractor types of 16.5 m and 18.5 m in length are actually allowed to carry 50 tons in the Nordic countries). But at the same time you can’t waste too much time packing the goods. The system must be versatile and easy to use, in order to cram those pallets in there as fast and as secure as possible. A system called the compartment double stock is also well-known in the industry (the beams seen in the trailer to the right in the drawing above), however, according to SpaceInvader, its patented pallet rack system is easier to handle, more flexible, carries up to 40% more load, is not constrained to one type of trailer, can be used in warehouses too, and can load from the rear as well as the side of the trailer. I am thinking that this is also a logical step in the inevitability of fully automated distribution of goods. I mean, electric trucks will obviously be autonomous soon enough and fleets of trucks should actually be much easier to run than fleets of cars for personal mobility due to the static routes and schedules of everyday logistics. The idea of packing the cargo space in an optimal way is also being tested within other logistic domains like with the Mercedes Vision Van concept where robots pack the van’s cargo space at the distribution center, drones load each packet through the roof of the van, and delivers it at your door step. If you are a truck driver, I would suggest you train yourself further in this high-tech field, or you might be obsolete one day. From left: CEO and partner, Steen Frederiksen. Top pallet: Inventor and founder, Jesper Rølund. Bottom pallet: Partner and head of operations Mads Klie-Holde. Photo by Kim Wendt.